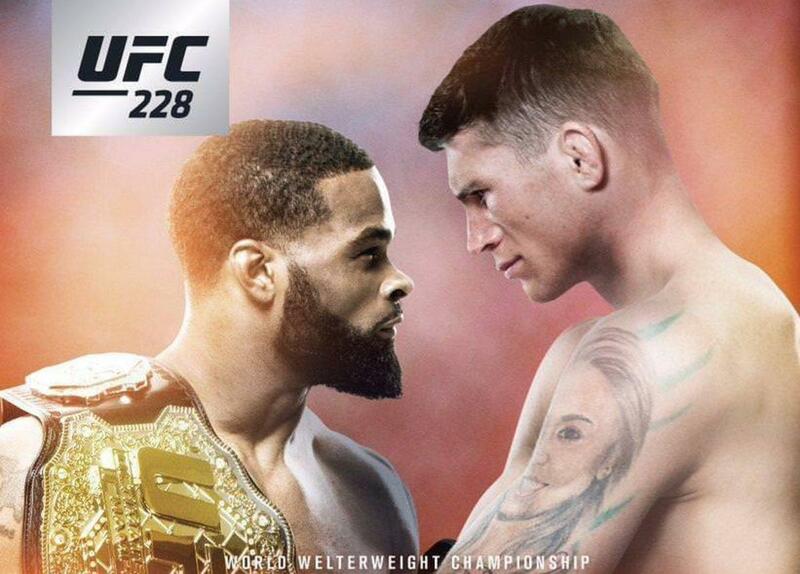 Welcome to F4WOnline.com's live coverage of UFC 228: Woodley vs. Till, emanating from the American Airlines Center in Dallas, Texas. The Octagon returns to Dallas with a 13-fight card featuring UFC Welterweight Champion Tyron Woodley defending against Darren Till in the main event. Woodley returns to action for the first time since July 2017, making his fourth title defends against the undefeated Till. Till has had a quick rise up the welterweight rankings, earning a title shot following back-to-back wins over former title challengers Stephen Thompson and Donald Cerrone. The card lost the co-main event on Friday after Nicco Montano was forced to withdraw from a scheduled UFC Women's Flyweight Championship title defense against Valentina Shevchenko after being hospitalized due to health concerns. Montano suffered from the effects of a tough weight cut, and has since been stripped of the UFC Women's Flyweight Championship. Also on the main card, Zabit Magomedshapirov looks to extend his 11-fight win streak against late replacement Brandon Davis, women's strawweight contenders Jessica Andrade and Karolina Kowalkiewicz battle for a potential title shot, Jimmie Rivera takes on John Dodson in a bantamweight bout and welterweight sluggers Abdul Razak Alhassan and Niko Price meet in an explosive contest. Among the fights on the preliminary card, former UFC Women's Strawweight Champion Carla Esparza takes on TUF winner Tatiana Suarez, and a bantamweight battle sees Aljamain Sterling take on Cody Stamann. Also among those fight on the prelims include original TUF winner Diego Sanchez and 30-fight UFC veteran Jim Miller. They trade and Brooks lands a right hand. Sanchez lands against the fence and goes for a takedown. They scramble and Brooks grabs the back. Sanchez gets on top and looking for a choke. Brooks is looking for a heel hook and he has a good hold of Sanchez. Sanchez with some hammerfists and elbows from the top. Sanchez with some hard hammerfists from the top. They get to their feet and Sanchez looking for another takedown. They trade punches in the tie-up. 10-9 Sanchez. Brooks lands a right hand and they exchange close before Brooks rushes out. Sanchez grabs a single leg as he shoots in for a takedown against the cage. Brooks gets the back and lands a couple of knees. Sanchez pulls guard and Brooks lands from the top. Sanchez spins to get his feet against the cage looking to explode from the bottom. Neither man able to do much on the ground as they look to improve position. Sanchez with a late armbar attempt but Brooks escapes. 10-9 Brooks, 19-19. Brooks with a spinning back fist. Sanchez then tries one but Brooks landed his better. Brooks with an uppercut and grabs the body lock against the fence. They scramble to the floor and Brooks in side control and lands an elbow. Sanchez trying to get out from the bottom but eats some punches from Brooks.They scramble to their feet and Brooks lands a knee. They go to the ground again and Brooks in the guard. Brooks with some big ground and pound on the top at the end to likely seal the round, and fight, for himself. 10-9 Brooks, 29-28 Brooks. They trade jabs early. Aldana with a leg kick but eats a counter jab from Pudilova. Aldana with a leg kick. They go back to jab trading. Pudilova lands a right hand. They trade punches. Aldana lands a hard right hand and then a leg kick. Aldana with another leg kick but eats a combo from Pudilova. Aldana lands a jab. They trade and Pudilova lands a kick. Pudilova lands a couple of kicks and they then trade leg kicks. Pudilova with a flurry late and Aldana is in trouble but saved. 10-9 Pudilova. They trade early and Pudilova remains aggressive. Pudilova is throwing a lot of volume but Aldana is landing slightly more of her strikes. Pudilova with a high kick. Aldana lands a hard right hand. They trade and Aldana stumbles. Pudilova rushes with Aldana against the fence. Pudilova with some more kick attempts. Aldana with a leg kick. Aldana witha big body kick. Aldana with a cracking jab and tries a takedown. They trade late. 10-9 Aldana, 19-19. Pudilova lands a combo early. Aldana with some leg kicks and Pudilova with a high kick before Aldana circles away. Pudilova with some body kicks. Aldana lands a hard right hand. They trade. Aldana lands a good combo. She's taking over the fight. Pudilova is throwing but not landing and Aldana is landing. Pudilova bleeding pretty good right now. They trade and Aldana lands better. Pudilova lands a nice left hand. Aldana with a front kick. Pudilova with a flurry. Aldana lands a knee in the clinch. They trade against the fence. Pudilova with a hard right hand late. Fun fight, close one. 10-9 Aldana, 29-28 Aldana. They trade and Miller with a leg kick. Miller with another leg kick. Miller lands a straight left hand and then another. Miller lands and White goes stumbling down and Miller gets on top and is landing lots of punches. He's close to finishing it but grabs the back and gets a rear-naked choke and White taps! Miller with a huge win in his 30th UFC fight. Sanchez runs right forward looking to land and goes for a takedown. Sanchez with a big slam. White going for a triangle. White with an upkick. Sanchez remains on top and is landing. Sanchez with more elbows from the top. Sanchez with big right hands from the top but White eating them well. Sanchez in side control looking for an arm. Sanchez postures up and lands more punches. More lands as the round ends. 10-8 Sanchez. Sanchez again comes forward. He eats a knee from White but turns that into another takedown. White lands another upkick. Sanchez with more control from the top and he is landing punches. White has no ground defense and can't get out from the bottom. Sanchez with more punches from the top. Sanchez in solid control in side control. He ends the round on top. 10-9 Sanchez, 20-17 Sanchez. Sanchez fires some lefts but White with a body kick and then drops Sanchez with a hard punch. Sanchez recovers and gets White down and Sanchez is in his guard. White almost landed another upkick. Sanchez with an elbow. Sanchez with more punches from the top and White is trying to scramble out from the bottom but can't do much. White trying to use the fence to help get from the bottom but Sanchez recognizes it. Sanchez back in the full guard and lands some elbows. White with more upkick attempts but Sanchez avoids them. Sanchez should cruise to the win here. 10-9 Sanchez, 30-26 Sanchez. They are throwing punches early. Both land and Byrd gets a clinch. Stewart pushes Byrd against the fence but Byrd reverses position. They break and Byrd with a leg kick. Byrd lands a right hand and they clinch. Brief scramble to the ground before they tie up against the fence. They break and Byrd with a high kick before clinching back up. A lot of clinching in this one. Byrd with a nice elbow. They trade elbows on a break and Stewart lands a right hand. 10-9 Byrd. Byrd with a leg kick. Stewart lands some body punches before they clinch. Stewart lands a left and then an overhand right. Byrd with an elbow off a clinch break. Byrd with some right hands and he is pouring it on Stewart. Stewart then rocks Byrd with a right hand. They trade right hands. Stewart is landing some big punches and then knocks Byrd down with a right hand and the referee stops it! Big stoppage by Stewart as he gets the win. Neal with a fast combination. Neal lands another left hand. Neal with a head kick and Camacho fires back a combo. Neal lands a left hand. They trade in close range. Neal with another head kick but didn't land as clean. Neal lands another hard left hand. Camacho is eating them clean. Neal lands another left hand. Neal is landing clean punches but Camacho is returning fire. They trade in close range. Neal drops Camacho late and looks for the finish by unloading punches but time runs out. 10-9 Neal. Camacho goes for a takedown but it is stuffed. Neal then unloads with a left hand followed by a series of punches. Neal is unloadking more and lands a flying knee but Camacho is eating it all and coming forward. Neal then lands a head kick that knocks Camacho out cold. Wow. That is for the highlight reel. Sterling with a couple of head kicks followed by right hands. Stamann tries a head kick. Sterling tries for a takedown but Stamann defends it. Sterling with a leg kick. He tries a head kick but it is blocked. Sterling shoots for a takedown but Stamann defends it against the fence. They trade and Stamann grabs the back. Sterling rolls out to escape but Stamann gets a body lock takedown. Sterling goes for a triangle but Stamann defending and escapes. They get to their feet. Stamann with a late takedown. 10-9 Sterling. Sterling landing some punches and mixing up well. He lands a kick and Stamann tries to pull guard and Sterling on top. Stamann gives up his back and Sterling looking to take advantage. He does for a moment but Stamann gets up and wrestles him to the mat. They get to their feet. Sterling gets the back and gets Stamann to the ground. Sterling in side control and moves to mount. Stamann gives up his back. Sterling with right hands and flattens him out. Sterling looking for the choke but has Stamann's arms trapped and lands punches. Sterling then gets Stamann to tap out after he grabs a leg in a weird position and has a kneebar locked in.. Wow. Sterling gets the impressive win. Suarez gets a takedown after searching for it for the opening thirty seconds. Suarez with punches from the top. Suarez with some sharp elbows. Suarez postures up and lands some punches. Esparza looking for an arm but lets go. Suarez just holding Esparza down and doing great work. They get up and Suarez with a slam and lands some punches. Suarez just too much for Esparza right now. Suarez with some knees to the body. Suarez with more punches. Esparza tries to find an opening to get up but Suarez keeps her down. Dominant round by Suarez. 10-8 Suarez. Suarez opens round two with another takedown. Esparza gets up but Suarez has the body lock against the fence. Suarez with a big takedown into side control and looking to pass over. Suarez in the full guard and lands some elbows. They get to their feet but Suarez with a trip takedown back into side control. Suarez with some elbows but Esparza escapes and Suarez takes her right back down. Esparza up and escapes back to punching range. Suarez with a high kick and then gets another takedown. Suarez ends with an elbow in side control. All her fight. 10-9 Suarez, 20-17 Suarez. Esparza looks for a takedown but Suarez blocks it and then goes for one of her own against the fence and gets it. Suarez in firm control as she has top position. She's going to cruise to a win unless she makes a huge mistake. Suarez trying to pass to mount but Esparza blocking it and Suarez goes back into full guard. Suarez with elbows from the top. Suarez gets the mount for a moment but loses it and gets it again. Suarez with heavy punches from the top and now some elbows. The fight is finally stopped by the referee and Suarez gets the win. Impressive showing. Alhassan with a leg kick and Price counters with a right hand. They are swinging for the fences early. Alhassan with some hard right hands and he is teeing off on Price. Alhassan loading on his punches and then he knocks Price out with a vicious series of punches. My god what a brutal finish. Impressive by Alhassan. Rivera with a leg kick. Rivera with another and Dodson counters by throwing some left hands that don't quite connect. Rivera with a body kick and they tie up for a moment. Dodson with a big head kick and Rivera eats it. Rivera with a leg kick. Rivera grabs the back and tries to pick up Dodson for a slam but Dodson able to block it. Not a lot happening and we gets some boos. They trade. Dodson hurts Rivera for a moment with a left hand. They trade late. Dodson with a body kick. Not much to it. 10-9 Rivera. Dodson tries to land the left hand but Rivera ducking under. Rivera with more inside leg kicks. They are exchanging in close range. Dodson with a high kick. Rivera lands a right hand. This is technically good albeit not as fast-paced as other fights tonight. Dodson with a body kick. Dodson is trying to find counters but isn't throwing with much volume when there's openings. We have a low blow now on Dodson. They trade getting back to action and Dodson with a late high kick that is checked. 10-9 Rivera, 20-18 Rivera. Rivera tags Dodson with a left hand and Dodson stumbles back for a second. Rivera lands a right hand. Dodson lands a counter left. Rivera with a leg kick. Rivera with some right hands to the body. The crowd is booing some more. They've been treated to a lot of violence tonight. They continue to exchange in close range. With a minute left there isn't going to be a finish here it seems. They trade body punches in the clinch at the end. 10-9 Rivera, 30-27 Rivera. Davis starts with a leg kick. Davis with some more and Magomedsharipov is switching stances. They trade punches. Magomedsharipov with a spinning back fist. Magomedsharipov tries a trip but Davis blocks it and wags his finger at him. Davis with a right hand. Magomedsharipov has his back against the fence and that might be trouble. They trade and Davis lands a nice uppercut. Magomedsharipov with a jumping switch kick. Magomedsharipov gets the back and looks for a takedown. Magomedsharipov with a slam but Davis props up. Davis landed a lot more in the round. 10-9 Davis. Davis with some kicks but Magomedsharipov gets a takedown and has the back against the fence as they get to their feet. Magomedsharipov has the back and Davis is trying to crawl away. The boos are beginning to return. Magomedsharipov gets a big takedown but Davis gets back to his feet. Magomedsharipov still has the back. Magomedsharipov gets a takedown and has the back and is working for a choke. He has one almost locked in. Davis gets out. Magomedsharipov going for it again. Magomedsharipov has a kneebar locked in and Davis taps out. Impressive showing by Magomedsharipov. Andrade with a arrage of punches early and Kowalkiewicz is already in trouble. Kowalkiewicz circling away but Andrade landing more. Kowalkiewicz now throwing. Kowalkiewicz lands some punches. Andrade with another barrage. Andrade lands a hard right. Kowalkiewicz tags her but Andrade fires back with huge punches. Already crazy ninety seconds in. Andrade then knocks Kowalkiewicz out with a vicious right hand. One punch ended it. You rarely see that in the strawweight division. Andrade lines up for a fight with Rose Namajunas now. Woodley with a hard right. They clinch and Till lands a knee and Woodley going for the takedown. Woodley has the body lock against the fence. They are broken up. That was quick. Woodley lands a right hand. Till with the jab. Woodley with a head kick. Till trying to find an opening. Woodley shoots but is stuffed. Woodley has the clinch against the fence. They are broken up again. Till lands a left hand. Till with a body kick. 10-9 Woodley. Woodley drops Till with a right hand and is looking for a finish. He is landing big punches from the top but Till is surviving. Woodley with more punches from the top. Till looking to hold him in the guard. Woodley postures up as Till has weathered the storm. Woodley steps to half-guard. Woodley with some elbows. Till trying to scramble out. Woodley with more elbows. Woodley with more shots from the top. Till is hanging on. Woodley working for a choke and he gets Till to tap out! Tyron Woodley remains the champion as he finishes Darren Till.